Few students are happy with their finances, but the ramifications of a lack of funding amount to more than the occasional own-brand product or night in. A 2015 survey by Future Finance found that 24 per cent of students gamble to supplement their earnings, nearly 13 per cent have taken part in clinical trials and a quarter owe money from payday loans. The venture of one group of Oxford undergraduates is attempting to change this, however. Launched this year, Silo (silofunds.com) is a funding platform aimed at university students struggling to find funding for their course. The result of a year's work funded by St Anne's Incubator Projects, it now boasts more than 2,000 users and is setting its sights on academic institutions across the UK. Wong tells me that 700 grant applications have been made this year, with 3 students already successfully crowdfunded. 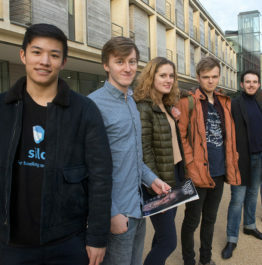 Silo is open to both undergraduates and postgraduates, but is targeted particularly towards those applying for MSt or DPhil courses, or those looking to finish their degrees. Wong hopes that a dedicated crowdfunding platform for higher education will more easily match students with like-minded companies and philanthropists, allowing them to hit their targets. With this in mind, Silo is reaching out to Oxford colleges to locate alumni interested in helping fund future students. Wong says that Silo are already in discussion with three or four colleges about helping redirect alumni to fund prospective applicants. For the 3 students successfully funded this year, moreover, 35% of the money has come from alumni. Indeed, after MPs recently rejected an amendment to guarantee the rights of EU nationals in the country before Brexit, Silo looks to be aiming to help at least ensure financial stability for international students. Recent affiliation with TheFamily, one of the largest business accelerators in Europe, and a shortlisting for the Oxford Emerge Pitch Competition will no doubt help spread the word.